For some clockmakers getting the clock to function is their only concern. For examples of this mind set see our Hall of Shame page. For other clockmakers, like Michael, there is an attempt to perform repairs in not only the most durable fashion but also in an artful manner. Whether it is drawing, painting, building model kits or repairing clocks Michael's personality leans toward detail, art and taking great pride in everything he does. For examples of some of his hobbies go to Mike's Hobbies page. Below are some examples of work that he has performed that showcase this concept. Unfortunately I cannot take credit for the engraving on this beautiful movement but I can take credit for making sure it looked its best during the overhaul process. 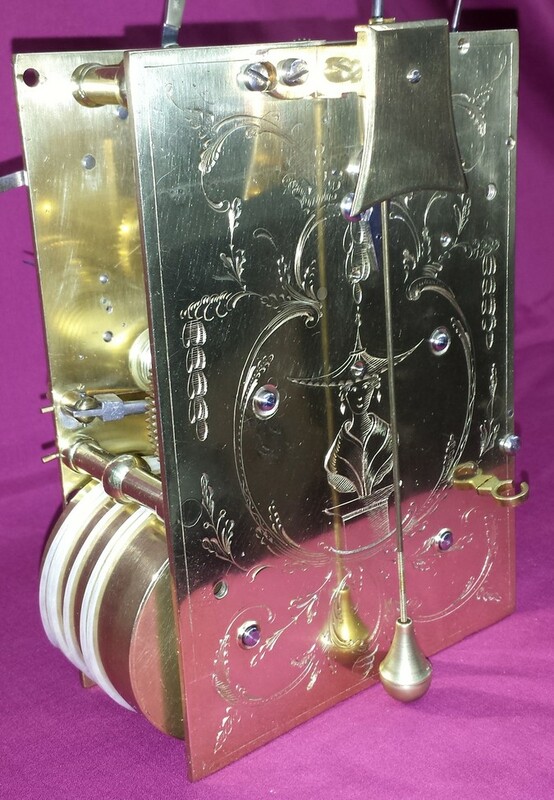 Here is an inside view of the same clock movement. Isn't it wonderful? 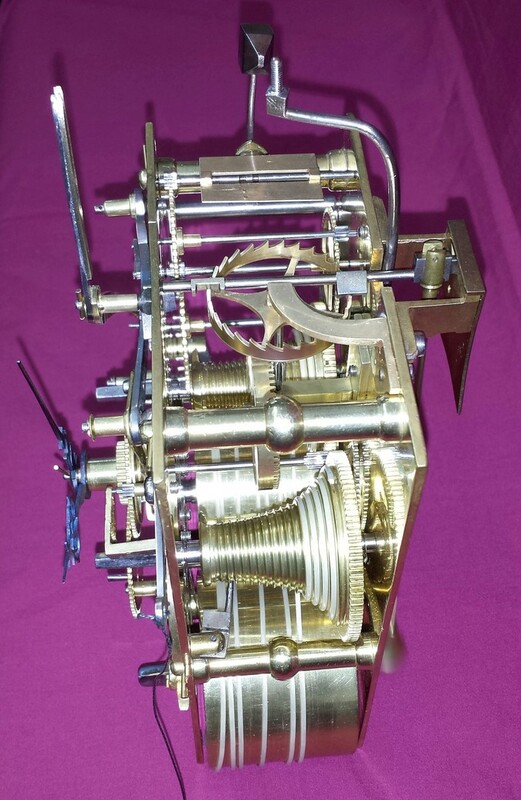 Michael received a clock in for repair that was missing the lever system that activated the striking function. Without any model to work from it would have been very difficult to replace what was missing. Fortunately he was able to locate an example of the missing levers from a friend who was gracious enough to let him borrow them. Once he had them he was able to go about the task of making a set of replacements. The old levers are located in the middle of the picture above and the new ones are on the outside. First the arbors had to be made on the lathe and then the additional wires protruding from the arbor "base" were added at the appropriate angles. This picture shows three things. The top picture is a damaged gathering pallet. It is difficult to see but the side of the pallet near the square hole is almost broken out. The middle picture is the raw material we ordered from a supply house to begin the project with and the third picture shows the completed gathering pallet. 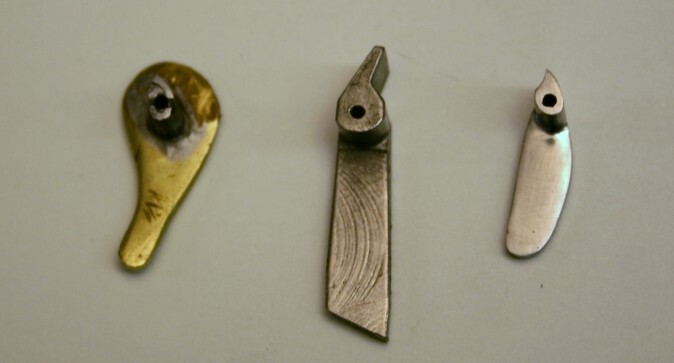 You can see by the difference between the second and third picture that a great deal of material had to be removed from the "blank" piece and the existing round hole had to be hand filed into a square hole. Here is another example. The gathering pallet on the left is not the original but one that some previous repairman cobbled together. Once again using the blank piece in the middle Michael began to remove material just like a sculptor does until the shape of the pallet was correct for the clock. This required constant back and forth; mounting the pallet, checking for fit, removing the pallet, filing/grinding off material and remounting again until the piece was functional.